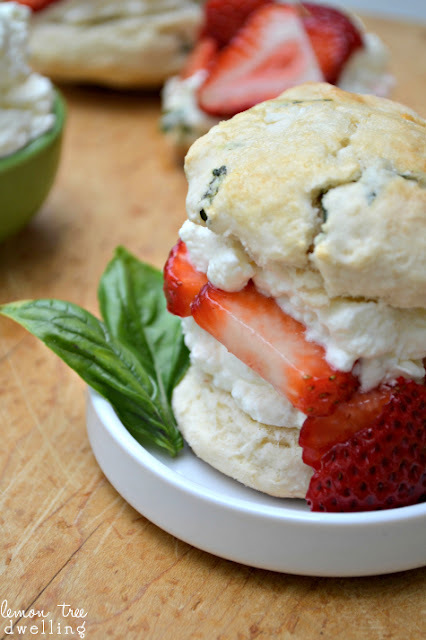 The simple addition of basil takes your favorite dessert to a whole new level! 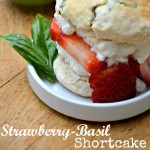 Strawberry-Basil Shortcake will make you wonder how you lived without it for so long!! 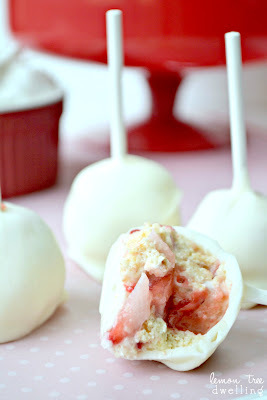 and I’m excited to share my latest summer dessert recipe with all of you! One thing you should know about me is that I’m a HUGE fan of basil….especially in the summertime! I love using it in salads, dips, drinks, and even desserts! 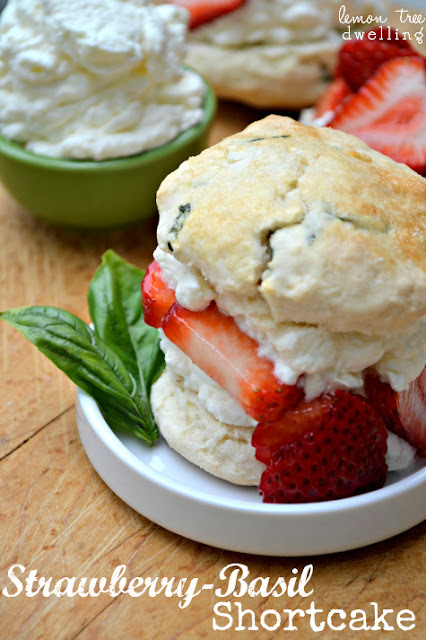 It pairs well with all types of fruit, but there is something about the combination of basil and strawberries that is just…..heavenly! And when you think of strawberry desserts, what comes to mind, of course, but strawberry shortcake!? I don’t know about you, but to me, strawberry shortcake always feels like a treat. Maybe it’s because of my childhood memories, when my mom used to make fresh shortcakes and top them with her powdered sugar sliced strawberries and vanilla ice cream….We would gobble them up and ALWAYS be left wanting more. To this day, I can’t eat homemade strawberry shortcake without feeling like I’m the luckiest gal in the world! The only difference, when you add basil? You feel even luckier!! 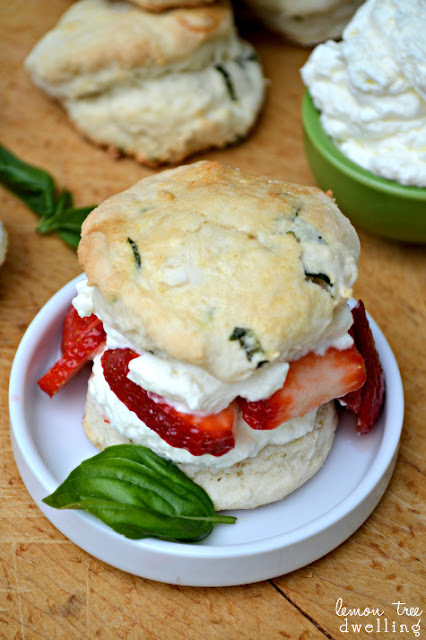 Because now the shortcakes are infused with a subtle basil flavor, and the strawberries are swimming in a pool of sweet basil syrup! So instead of a delicious dessert that reminds you of your childhood, you have an AMAZING dessert that both reminds you of your childhood….AND makes you feel lucky as all get out to be an adult! Combine sliced strawberries and basil simple syrup in a bowl and set aside. For the shortcakes, combine flour, 3 Tbsp. sugar, baking powder, and salt in a food processor. Add butter pieces and process until the mixture resembles cornmeal. Transfer to a bowl. Blend half & half with the beaten egg and pour into bowl with the flour mixture. Add fresh basil. Stir until large clumps form; continue mixing and kneading on a lightly floured countertop. *Add flour as necessary until dough is the right consistency. Pat the dough into a 9x6 inch rectangle about 1 inch thick. Use a floured 2¾ inch biscuit cutter or the top of a glass to cut out 8-12 circles (depending on size). Place each dough circle on a parchment-lined baking sheet, brush with beaten egg white, and sprinkle with remaining 2 Tbsp. sugar. Bake until golden brown, 12-14 minutes. 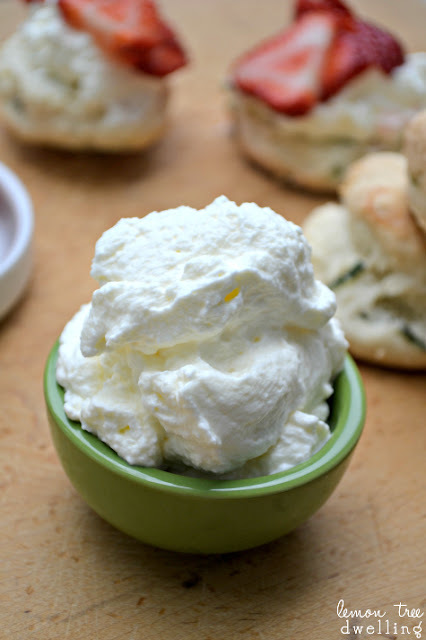 Prepare whipped cream by combining whipping cream and 2 Tbsp. sugar in a medium mixing bowl. Mix and low speed to dissolve sugar, then at high speed until mixture is light and fluffy and has doubled in volume. To assemble: Cut shortcakes in half. Place bottom half on a plate and generously top with strawberries, whipped cream, and the top half of the shortcake. Thanks again to Desiree and to all of you for having me here today! I’ll be back next month with another of my favorite summer recipes. I feel so lucky yo have Cathy as part of our team. She is such an extraordinary cook and I love how her recipes are fun and unique. 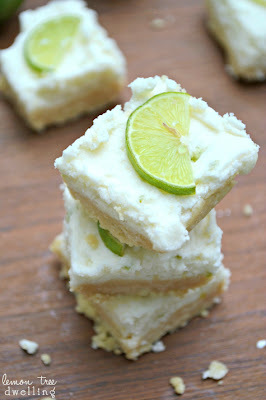 I’d love for you to stop by Lemon Tree Dwelling for a visit, and to check out a few of her other recipes! Facebook, Twitter, Google+ and Pinterest. Have a delicious day everyone! I'm Cathy, a mom of 3 who loves cooking, crafting, decorating, and having fun with my kids! Come see me and check out my ideas at Lemon Tree Dwelling! This looks so amazing Cathy! Off to check out your other amazing ideas! That looks delicious. I’ve never tried it with basil. I bet it’s good. Thanks, Vanessa! 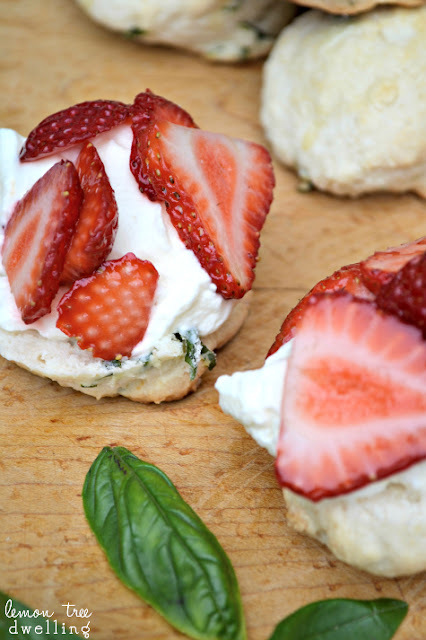 The basil is seriously my favorite part….it’s such a nice complement to the strawberries!! These are so intriguing! I’d love for you to link them up with me this week!